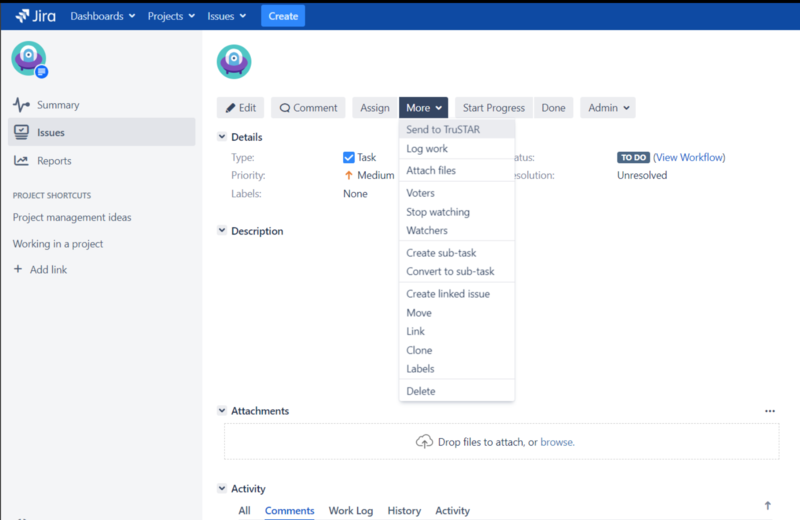 Leave excluded projects field blank if you want all cases created in JIRA to be submitted to TruSTAR. 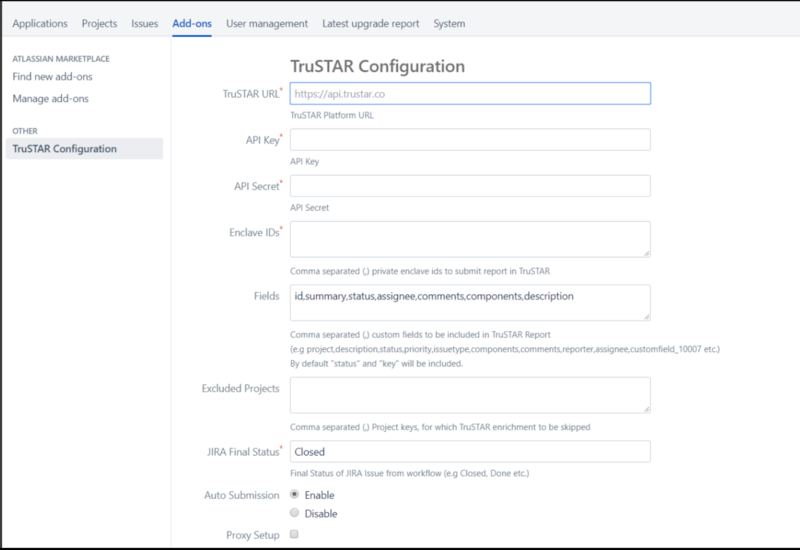 Once a case is created in JIRA the TruSTAR integration will trigger Submit Report event to TruSTAR if user selected to auto submit reports to TruSTAR. This case will be submitted as a TruSTAR report to the enclave(s) you have identified in your configuration. After the issue is submitted into the select enclave(s) in TruSTAR it returns a deep link in the comments section to the case in TruSTAR station. You can click on this link to take you to the case in TruSTAR. Enrichment from TruSTAR will be added to the comments section of the JIRA issue as list of high priority indicators and correlated indicators. 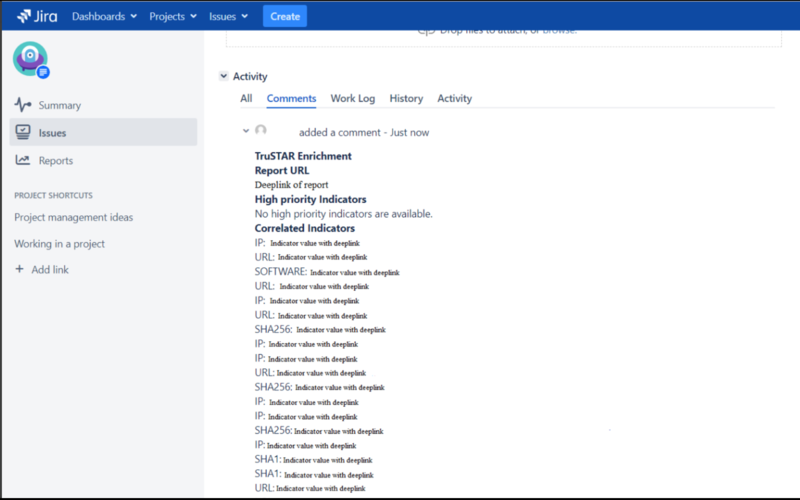 Whenever an issue is updated in JIRA it can be automatically or manually updated in theTruSTAR and a deeplink of report, high priority indicators and correlated indicators for that report will be added as comment in the JIRA issue. Whenever the status of the issue is changed to final status configured in the configuration page and auto submission is enabled, corresponding report of that issue in TruSTAR will added. This feature will delete report of a deleted issue from TruSTAR if auto submission is enabled. If auto submission is disabled, user need to delete report manually from TruSTAR.